Once, Matsar, a demon, asked Sage Shukracharya, "Please tell me how can I rule the worlds?" Shukracharya replied, "You should perform tapasya to please Shiva and chant the mantra Om Namah Shivaya. " Matsar stood on one leg for years, chanting the mantra. Pleased, Shiva bestowed a boon on Matsar that no human, god or demon could kill him. Matsar took over the three worlds - heaven, earth, and patal-lok (the underworld). He started troubling everyone. Soon, Matsar conquered Kailash, the home of Shiva. Gods prayed to Ganesha because only his Vakratunda (twisted trunk) from could defeat Matsar. Finally, Ganesha took his Vakratunda form. 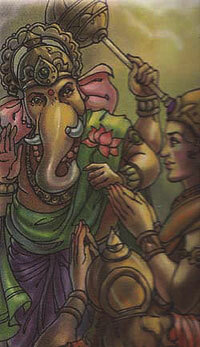 He used a weapon that entangled Matsar and he prayed to Vakratunda for forgiveness. Vakratunda said "I will forgive if you promise to return heaven and earth and never trouble anyone." Matsar promised and Vakratunda set him free.